Yesterday, I was given a Roland U-20 by one of the sales clerks at a local Hard Off store here in Japan. Only one key was working and rather than just selling it as junk, he decided to just throw into the bag along with my guitar strings that I purchased…laugh. I told the guy that it was a very common problem with the Roland U-20 that the keys were bad so perhaps I might be able to find more info and try to fix it. He said “Good Luck” and I was off on another project. 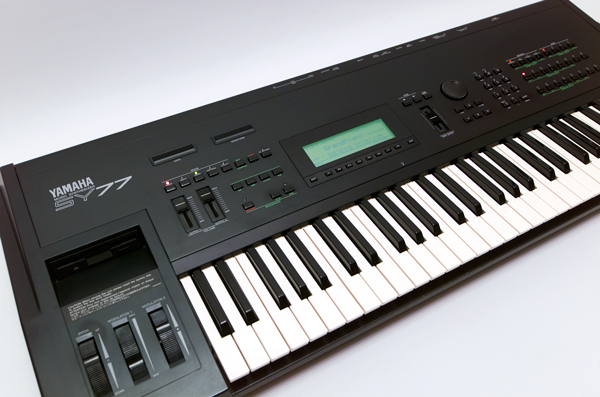 With the success a day earlier with the Yamaha SY77 in my previous post, I was looking forward to the Roland U-20 challenge. This article talks about some things that did not work and some repair methods that worked 100% in fixing the key issue. Below are some points to remember about the Roland U-20 problems. 1. The Roland U-20 is a easy, but time consuming to take apart. You pretty much have to unscrew everything and move the PCB boards out of the way in order to get the keys out of the U-20. It’s very simple to do, but a pain to have to remove everything. I actually just removed the screws and shifted them around to make clearance so that I could slide the key assembly around. 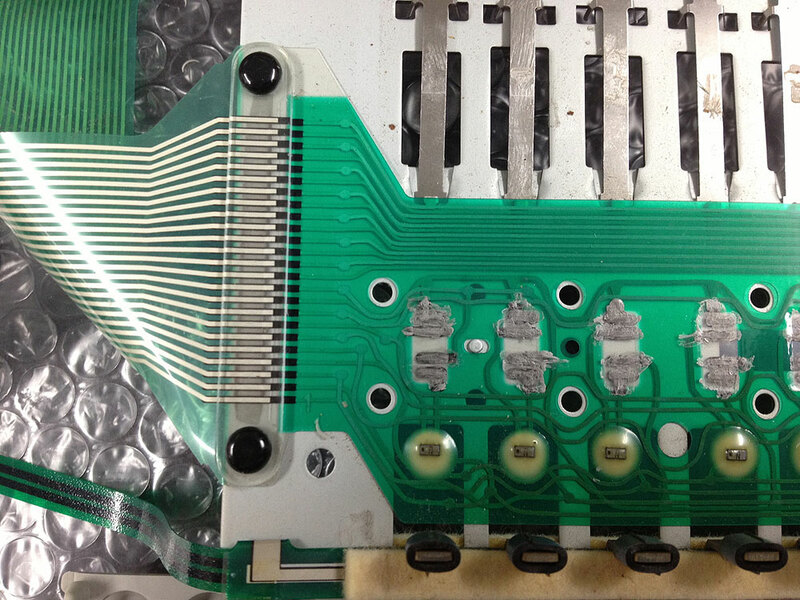 The components, especially the ribbon cables are delicate so be careful and take your time. 2. There is a flimsy ribbon cable attached to the key assembly ( see photo below ) which I did not remove. 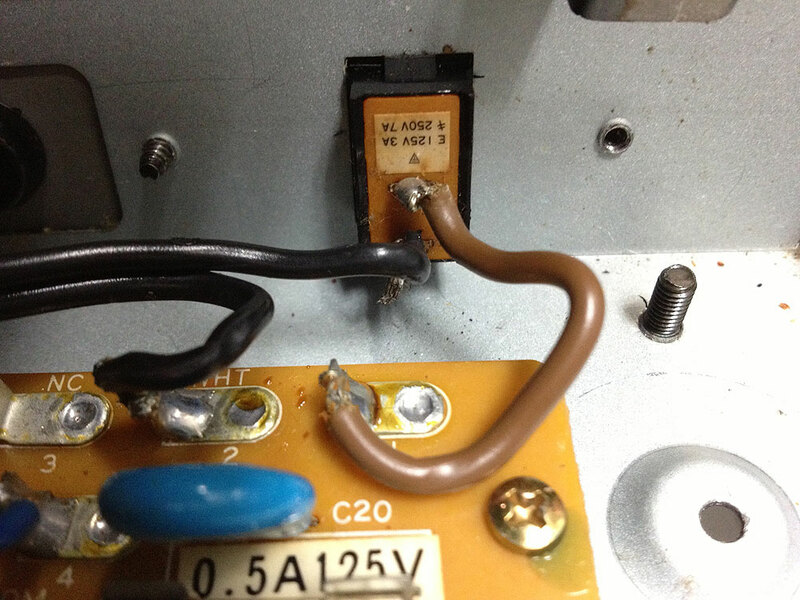 I’ve heard one shouldn’t remove this cable because it “could” result in the removal of some of the traces. If that happens, it’s easy to repair, but I found that I didn’t need to remove the cable. Instead I removed the key assembly and while balancing it in one hand, I reached over and placed the metal bottom cover back on. I then carefully placed the key assembly on a work towel on top. The ribbon cable is just long enough to rest the keys on the bottom of the synth to work from. The reason for doing this was so that I could test each key with the power on when ready. There was NO WAY I was going to put all this back together only to find out one key didn’t work. The keys were going to work perfectly before I reassembled the U-20 and so it was paramount that I could test the keys during my repair. Resting the key assembly on the bottom of the synth meant I could cover the PSU and not worry about bumping any of the other components during the repair process. I worked with the power off until I was ready to test the Silicon rubber contacts. 3. The Roland U-20 also has the dreadful red epoxy problem. You can see in the photo that the epoxy is already starting to break down. Usually I soak and wash the keys in a special solution that removes the red epoxy. This can take several days, so for a quick fix that works well, I simply apply some rubber goop cement that actually acts as a sealant to prevent the red epoxy from escaping. Since the epoxy is at it’s earliest stages of breaking down, I found the quick fix to be enough to cure the problem. Now if the weights were falling off and the keys were sticking together, I of course would opt for the full cleaning workout. 4. 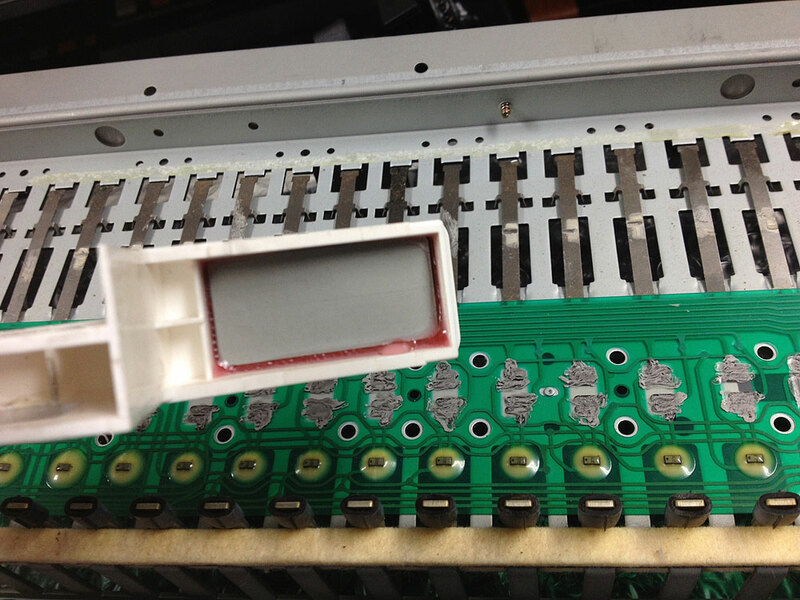 The Roland U-20 suffers from the reduction and/or obstruction of the carbon Conductive contacts/prints on the PCB board and Silicone Rubber pieces. In the photo below, I used a product called Caikote 44 which allowed me to apply a thin Conductive Silver/Carbon Coating over both the Silicone Rubber contact AND the carbon print contacts on the PCB board. IMPORTANT!!! In the photo you will notice I did a rather messy job of applying the conductive coating onto the PCB board carbon prints. This is WRONG! I had a “DUH” moment and realized that you MUST apply the conductive coating on each individual carbon contact without touching the others. I later went back with some alcohol solution and removed the excess in between the contacts. Each key has 3 or 4 individual carbon prints to coat. Some people just clean these with alcohol cleaner and put the key assembly back together. I find this didn’t work at all for me and I felt it was a bit unreliable as well or at least could be. 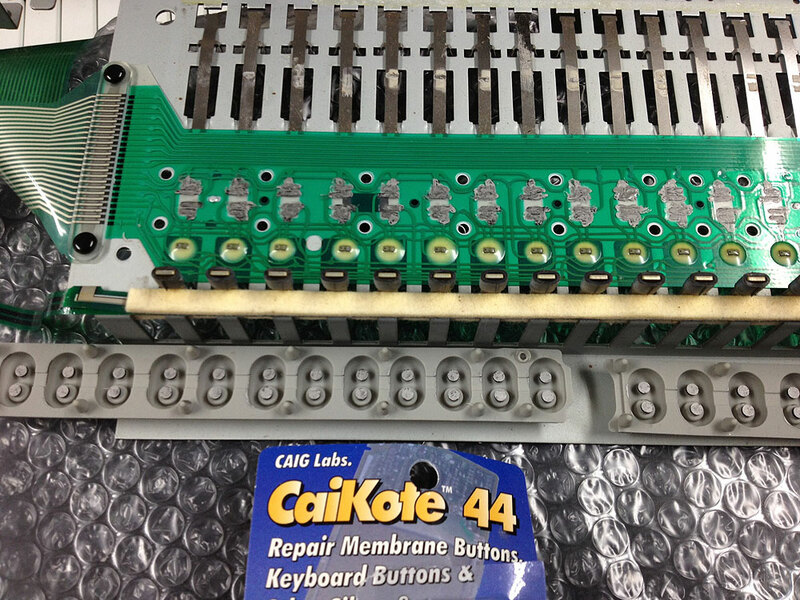 Instead I found with past experience that on the Korg PolySix, Caikote 44 was THE BEST solution for cleaning this annoying problem without ever having to think about it again. This is laughingly why I caked the stuff on the first time because boy it works wonders. My Polysix has been playing beautifully ever since I slapped that Conductive Silver/Carbon Coating on it. I can tell you it works awesome for the Roland U-20 as well. Note, you may need to use a toothpick or something thin in order to apply effectively. When I tested the keys with the slop job I did above, none of the keys worked. I then knew I was suppose to apply the Conductive Silver/Carbon Coating to each contact individually. This makes sense and I don’t know why I did it the messy way…laugh. Actually I’m being hard on myself in that I really wasn’t sure, so I suppose I now have the experience of knowing otherwise. After putting the Roland U-20 back together, everything works perfectly. It simply sounds great and all of the keys work 100% as they should. I can also rest assured that with the application of the Conductive Silver/Carbon Coating, I won’t be waking up on a cold morning to discover one key is now dead. It should continue working “hopefully” for years to come. I will say again though as I’ve said it in past articles. 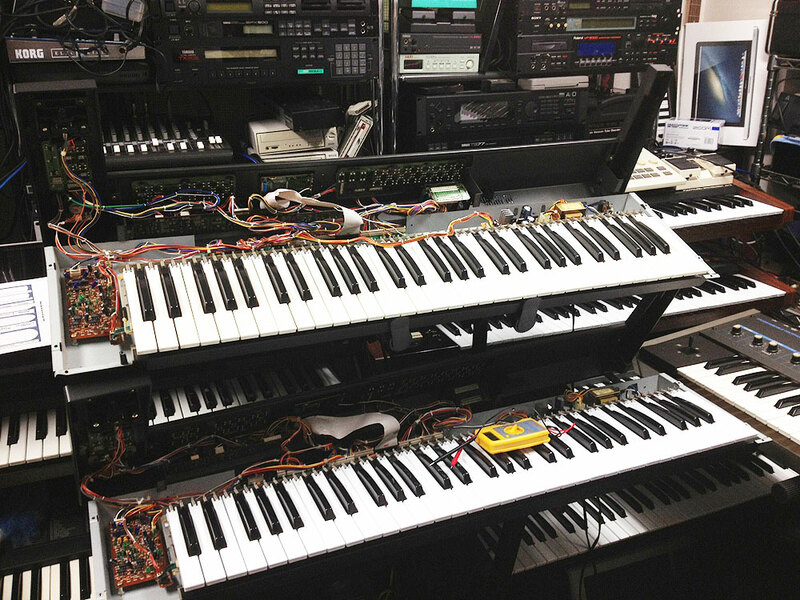 You really need to keep playing these synthesizers to keep them in shape. Letting them sit for years on end will not keep them in good “working” condition. They need to be played, especially synths with key issues. The Roland U-20 is a fun little synth. It has some great sounds on board that don’t seem to exist in later Roland models such as the JV-1080. Some of the Roland U-20 sounds are pretty unique. Furthermore, the U-20 has TWO programmable chord memory buttons instead of one that many other synths have. This allows for some creative playing which I enjoy. There is also an arpeggiator that can also be applied to the chord memories. Plus there are a couple of assignable slider controls. The U-20 has six parts and an additional rhythm part for external sequencing. There is a transpose button, joystick with modulation, and jump button for easier editing of sounds. It’s about the size of a Nord Lead and it’s very light weight. The keys actually feel pretty good once you have them in shape. Mine don’t clack or trip my fingers up at all. There are some classic sounds on board and the effects sound wonderful too. Yes it’s old, dated, and limited a little bit, but it definitely has a bundle of character. Yes, it’s a rompler but the kind I don’t mind having at all. It will do the job just fine. Recently I acquired my 3rd Roland Juno 2 synth for free because it simply wouldn’t turn on. The owner said it worked before putting it into storage, and then about a year later he turned it on and nothing happened. He gave it to me because he already had too many door stops…laugh. I thought maybe I could fix it, but it’s proven to be quite stubborn. Above is a photo of my work area where I’m currently testing the broken Juno-2 (bottom one) with a fully operational one above (top). The Roland Juno-2 basically has never been opened. I open a lot of synths and I can tell that I’m the first one to crack it open. The Juno-2 is in excellent condition all around. When you flip the power switch it’s completely dead. No flicker, no heat, no noise, nothing. It’s like the power doesn’t even get to first base or even into the machine. 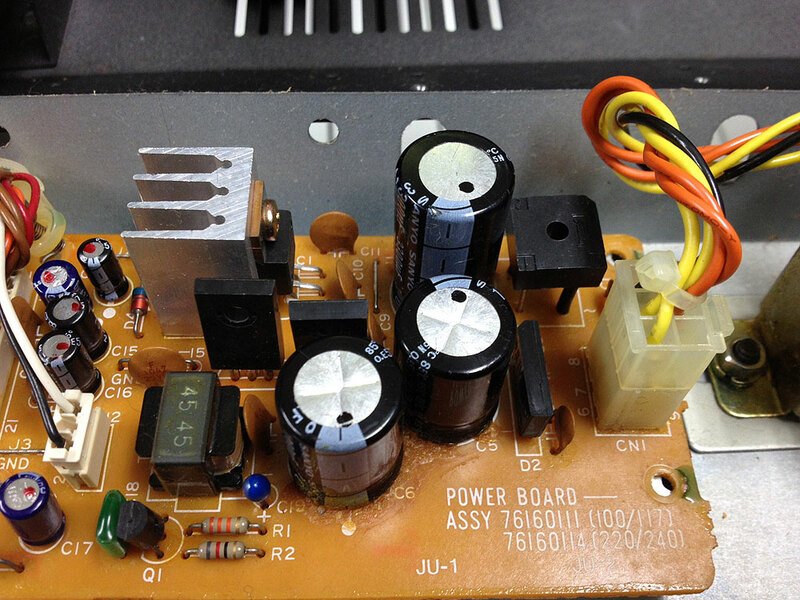 I do try to repair my own synths, however I usually leave the Power supply area alone as that is not my strong point. Inside the Juno-2 seems pretty basic, so I thought I would scout around and see if I could find the problem in the hopes that it might be a simple fix. I opened up the synth and inside everything seemed clean and connected. 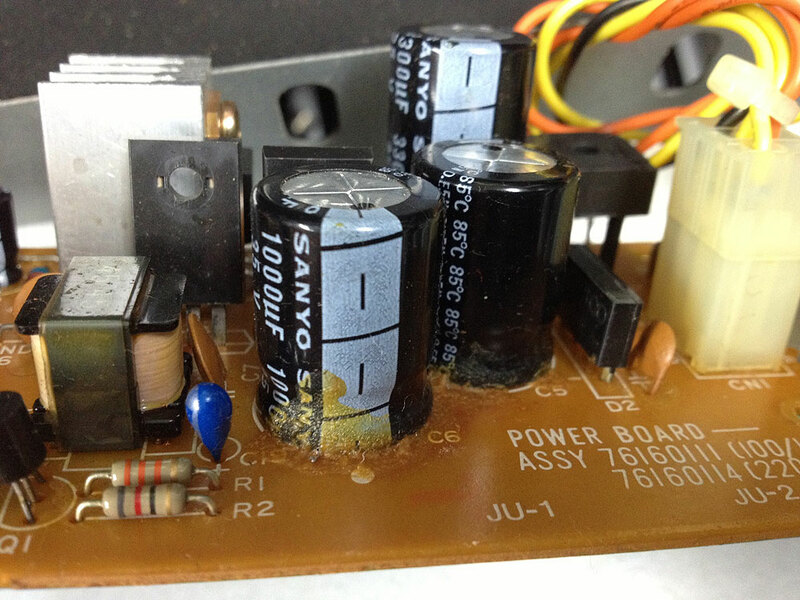 The power cable was fine, the switch looked good, along with everything else…BUT… the Electrolytic Capacitors looked funny to me on the Power Supply Board. 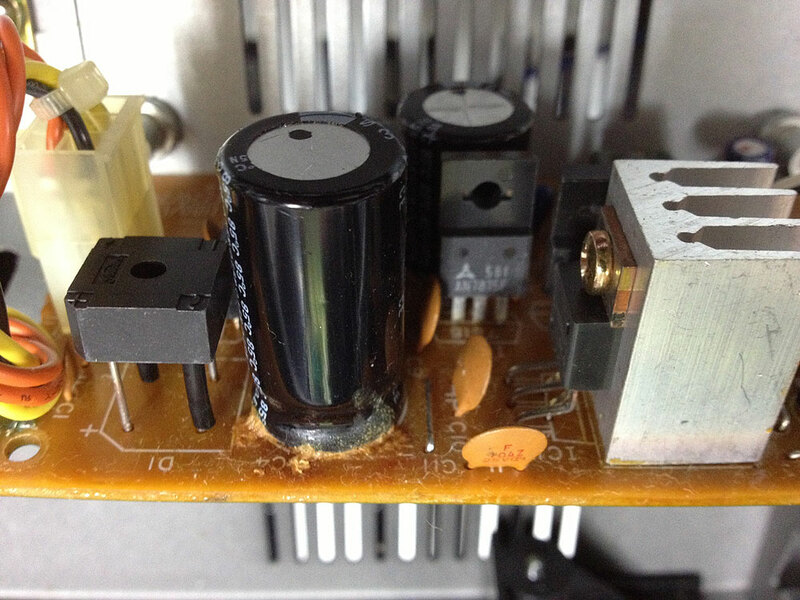 Usually if they are bad I notice a bulging at the top, however the three capacitors on the power supply board look fine on top. The bottom however look like they could either be leaking or perhaps surrounded by a glue of sorts. I’m not sure which, although my guess it’s a leak. It’s kind of dull and crusty while glue is usually shiny and smooth. My thoughts are that if the Electrolytic Capacitors are bad, that might be the reason the Juno-2 is not turning on, OR getting power to the rest of the synth from the Power Supply board. Otherwise, I have no idea why the Juno 2 will not power on. I wrote a comment below about the switch looking bad. Here is a photo. The wires are loosely soldered to the two plugs attached to the switch. The two plugs wiggle. On my other working Juno-2, the switch, plugs, and wires are rock solid with zero play. After using a Multimeter and checking for continuity all over the Juno-2, I’m finding zero problems. It really has me stumped. 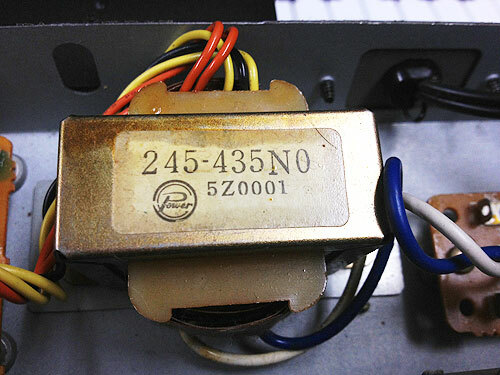 The only area I can seemed to properly check is the Power Transformer shown in the photo below. This sits in between the Power Supply board on the left and the Fuse board to the right. Both the Fuse and Power Supply Boards are 100%. Still when I turn on the Juno-2 below I get zero power past this Power Transformer. Could that be the cause? Not sure. I have discovered through swapping everything around with a working Roland Juno-2 that there is a definite problem on the MAIN BOARD. The battery has been changed and reset procedures have been done, but there is still no sign of life. There must be a broken connection somewhere and so I’m now consulting the Service Manual. Stay tuned! !